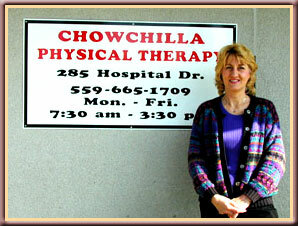 Chowchilla Physical Therapy has been meeting the physical therapy needs of the Chowchilla community and outlying areas since July 1, 2003. Operating out of the Chowchilla Medical Center, a familiar location for many Chowchilla residents, Chowchilla PT is able to provide a comprehensive range of outpatient services. Our facility has a gym that includes a V5 Hoist weight system for all major muscle groups, pulley weights, treadmill, and an upright and recumbent bike. There are parallel bars for gait and balance work, as well as exercise plinths. We have three private rooms for treatment of soft tissue conditions. A variety of equipment such as physioballs, foam rolls, balance boards, and inversion traction, etc. are available for use. We offer Anodyne treatment to help reduce the pain and numbness of the feet caused by peripheral neuropathy. Other specialty techniques include Massage Therapy, Bowen Technique, Total Body Modification, Craniosacral Therapy treatment for positional vertigo and others. We are aware that many of the residents of our community travel to Merced, Madera or Fresno to make regular physician visits. We know that when your physician wishes you to have physical therapy treatment it is a commitment of 2-3 times a week for usually 4-8 weeks. Most physicians are aware that we are here to serve your town. If your physician is not aware of our existence you can inform him/her you would like to have your therapy in Chowchilla, and we will be happy to do the rest of the work communicating with your physician so that you can begin your quality, effective treatments right here in town.